As the comments on WPBeginner grew, we tried different solutions, like Livefyre to improve discussions on our site. Many WordPress users want to make comments on their website more social. This is why people try Facebook comments, Disqus comments and now even Google+ comments. Recently we came across a plugin that allows you to add forums to replace comments in WordPress. We liked the idea and decided to test it out. In this article, we will show you how to add bbPress forum to WordPress posts as comments. Forums are a great way to build online communities. For many WordPress websites, the community building features of an online forum can not be replaced by WordPress commenting system. Similarly, a forum software can not be a replacement for WordPress. However, combining them both may result in a killer combination of lively discussions, community building, increased user engagement and more user loyalty for your website. Users can participate in forum by leaving replies to your posts or by creating topics in other discussion areas. Conversations originating from your articles can ignite multiple topics on your forum. Most importantly, when people participate in an online forum they are more likely to share it among their social circles. We understand that not every WordPress website has the audience or desire to build communities. There is so much content on the web that does not get any comments at all despite receiving significant traffic. However, if you are running a website that generates lots of comments, discussions, debates and heated arguments among your passionate readers, then you can benefit from the interactive features of an online forum embedded right into your articles. First thing you need to do is to add bbPress forums in WordPress. We have a step by step guide to setting up a forum in WordPress with bbPress. Once you have installed and set up bbPress forum. Make sure you have created at least one forum. You can give this forum any name, for example: Website Discussions, Posts Discussions or anything you want. The next thing you need to do is install and activate bbPress Topics for Posts plugin. 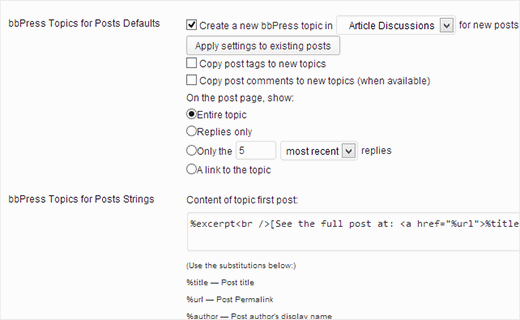 After activating the plugin go to Settings » Discussion and scroll down to bbPress Topics for Posts Defaults section. The first option in setting up bbPress topics for posts is to choose a forum where topics for your WordPress posts will be created. You can choose a forum that you created earlier, or you can choose different forum for each post manually when writing your article. If you choose a default forum, you can apply these settings to all your existing posts by clicking on Apply settings to existing posts button. 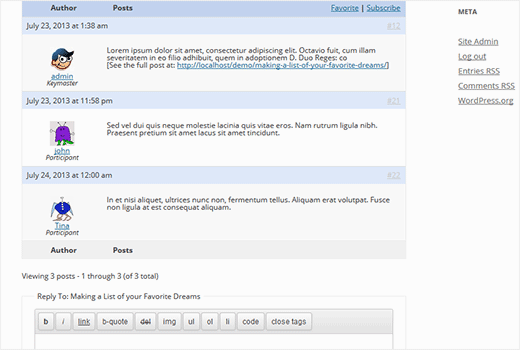 This will create topics for all your existing posts in the forum you have selected. You can choose whether to copy your post tags for forum topics and choose how many replies to show below each post. If you want you can show the entire topic below the post or even display the link to the forum topic so that users can discuss the post in your forum. We would recommend displaying a reasonable number of replies like 10 for each post. Now if you chose a default forum to create topics for posts, the plugin will automatically create a topic for a post you publish. 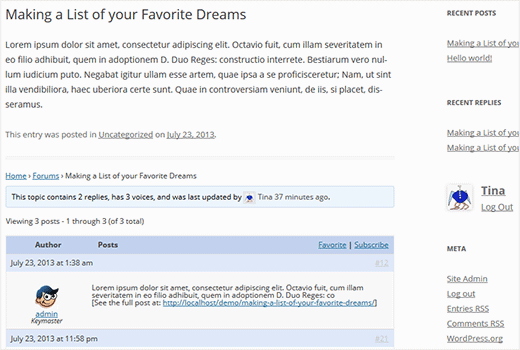 It will also display latest replies to that topic with a topic reply form at the bottom of your posts. If you did not choose a default forum on the discussion settings page, then you can still create a topic for each post manually from the post edit area. On the post edit screen click on Screen Options fly-down menu at the top right corner and check the discussion box. Scroll down to the bottom of the post edit area, and you will see discussion box that allows you to enable or disable comments and trackbacks for individual posts. There will be a new option to create a forum topic for this post. If you are using bbPress forums as a replacement for comments, then you might want to turn off comments on your site. To do that go to Settings » Discussion and uncheck the box that says Allow people to post comments on new articles. This will disable comment form to appear on any new articles you add. However, people can still post comments to older articles. To turn off comments on all articles you can run this SQL query using phpMyAdmin. Note: You must always backup your database before making any direct changes to it. This query updates posts table in your database and sets comments to be closed on all posts. Please note that if you are not using the default wp_ prefix for your database, then your posts table may have a different prefix so you would need to change posts table name. 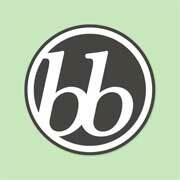 What do you think about the idea of using bbPress forums to replace WordPress comments? For questions and feedback you can reach us on Twitter or leave a comment below. Is there a way to have this option: “Use a bbPress forum topic for comments on this post” check marked by default when adding new posts? Which comment program do you use here? We use default WordPress comments. But I have one question. It works for default post type, but not for custom post types… Any idea how solve that? Looks like they are now delaying adding this feature until 2.7 release. I am thinking of installing this plugin on my new site but it hasn’t been updated for ages. Does anyone know if it still works or there is a newer alternative plugin? I want to open topics on different forum categories, how can i do that? as bbpress 2.6 still isnt out do you think the topics for posts plugin is still worth using in the meantime? its got the not updated for over 2 years thing at the top in the wordpress plugin repo? No, but you can reach out to plugin author and ask them if they intend to update the plugin any time soon. Can readers login on the bbpress forum/commenting system with social media such as Facebook, twitter, etc. ? Looks like a good way to keep a forum alive. What worries me is the risk of duplicate content, any thoughts on this? Hi and thanks for your great article ! I would like to use that but I’d like to have 2 different topics for each posts which is created, not only one. Is it possible ? How ? So say you have a new reader and they want to comment how does the email capture work and forum login work ? Im hoping its EASY AS FOR TH READER E.G. How does it work? would like to save there email with mail chimp as well ? I think this is a cool idea, however you are not using this method on this post…did you find that it did not work well? Just curious. No we did not try it on WPBeginner. Good article. Might be worth noting that this will be a core featured in bbPress 2.6 http://bbpress.org/blog/2013/11/bbpress-2-5-released/ I’m looking forward to it. One feature suggest by me might also be in the core of 2.6 release, so I’m looking forward to it too.